This practical book provides empirically supported techniques that are effective for a wide range of problems, including enuresis, panic disorder, depression, and skills acquisition for the developmentally delayed. Chapters are authored by experts in their particular treatment approach. Jane E. Fisher is Associate Professor of Psychology at the University of Nevada, Reno. William O'Donohue is Nicholas Cummings Professor of Behavioral Healthcare Delivery at the University of Nevada, Reno (UNR). He holds adjunct appointments in the Department of Philosophy at UNR and at the University of Hawaii at Manoa. 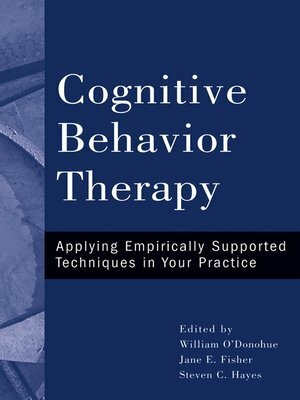 Steven C. Hayes is a former president of the Association for Advancement of Behavior Therapy and a Foundation Professor of Psychology at the University of Nevada, Reno.